Welcome back for another round of Colour INKspiration. 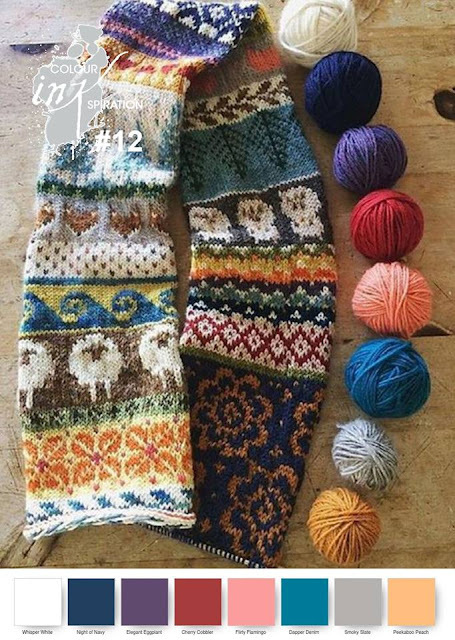 The groovy photo #12 for inspiration this week has so many elements- texture, stitching, loads of colour, geometric patterns,stripes sheep, trees, waves, balls, timber....it was too much for me initially. I love all the elements but having to choose a few was hard for me. .. or even a starting point! So I have been avoiding trying to create from this picture until tonight when I went for a long walk and the gorgeous sunset colours spoke to me. Deep blue and purple at the horizon, golden peach at the lower end of the sky, reflecting off the buildings with a beautiful glow, stretching up to gentle pink and a soft blue at the "top" of the sky. I knew then what colours I would use. I took a panel of shimmery white card and wet it with my aquapainter then painted stripes of the navy and eggplant and let the water move the ink around. Drying each band of colour before adding the next meant that I didn't end up with a dirty brown mess. 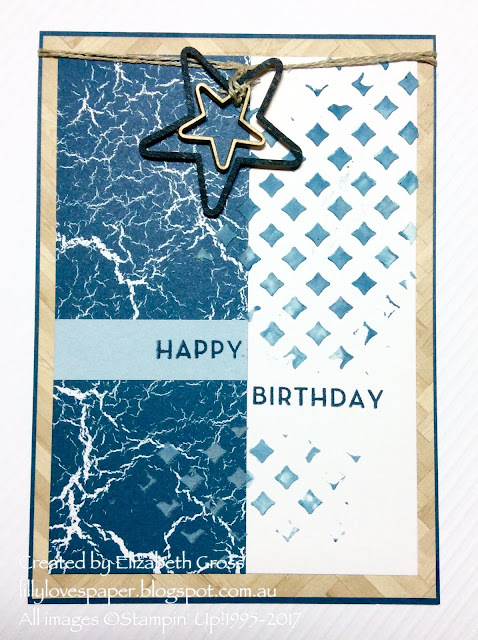 I also didn't blot off any of the water, so the heat gun moved the little driplets of water around until the moisture evaporated and the trails of colour were left on the card. I didn't add in dapper denim but kept to the navy and eggplant. Then it was a simple matter of stamping over the watercolour. I am not traditionally a "purple person" so Navy seemed perfect for the sentiments and card base. 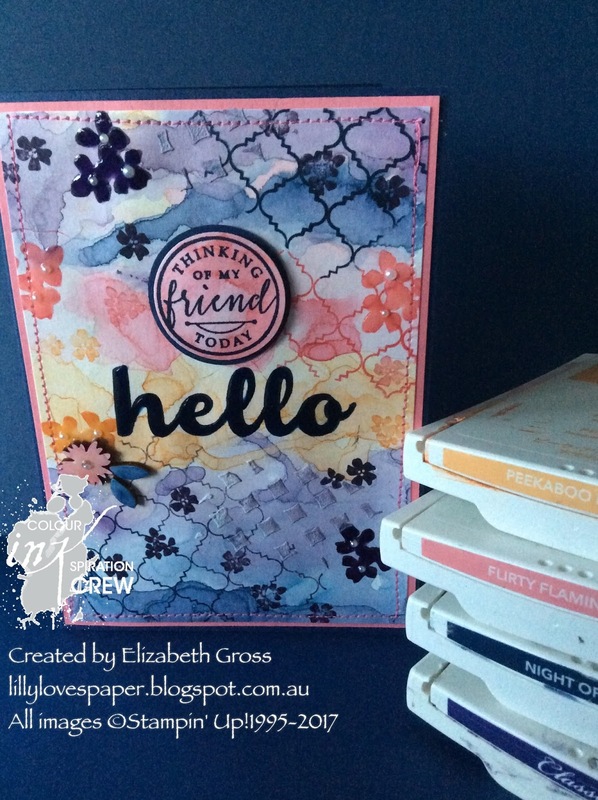 The Hello Friend set is so lovely and has both texture and image elements so I had a bit of fun using the stamps and trying to stamp each colour only on itself. 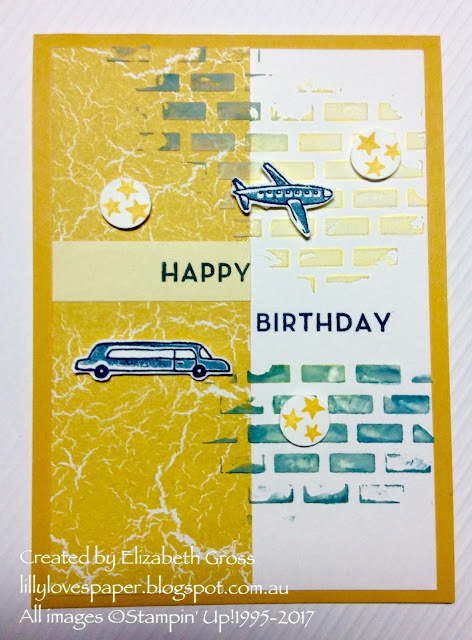 I added some embossing paste which I coloured just by using my "sponged mask embossing technique"sponging method- it's so clean and there's no wastage of paste - and you can achieve a lot paler intensity of colour. I have more details on this technique here and here. And how could I not add some stitching? It's right there in the photo! 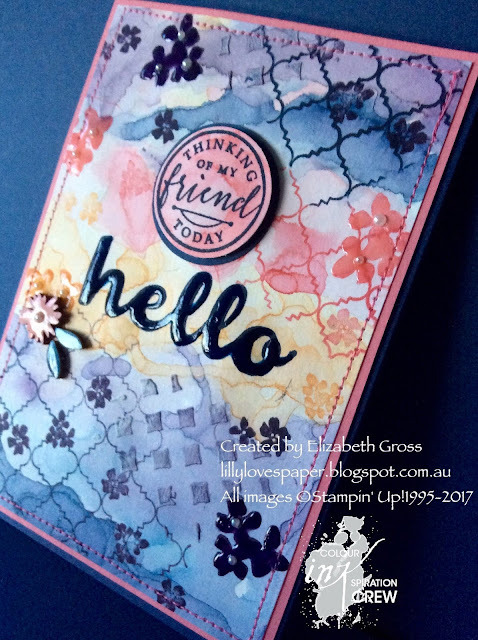 When it was all together it still lacked something so I simply used the fine tip glue pen to colour over the flowers and "hello". It dries glossy and adds a beautiful shine. 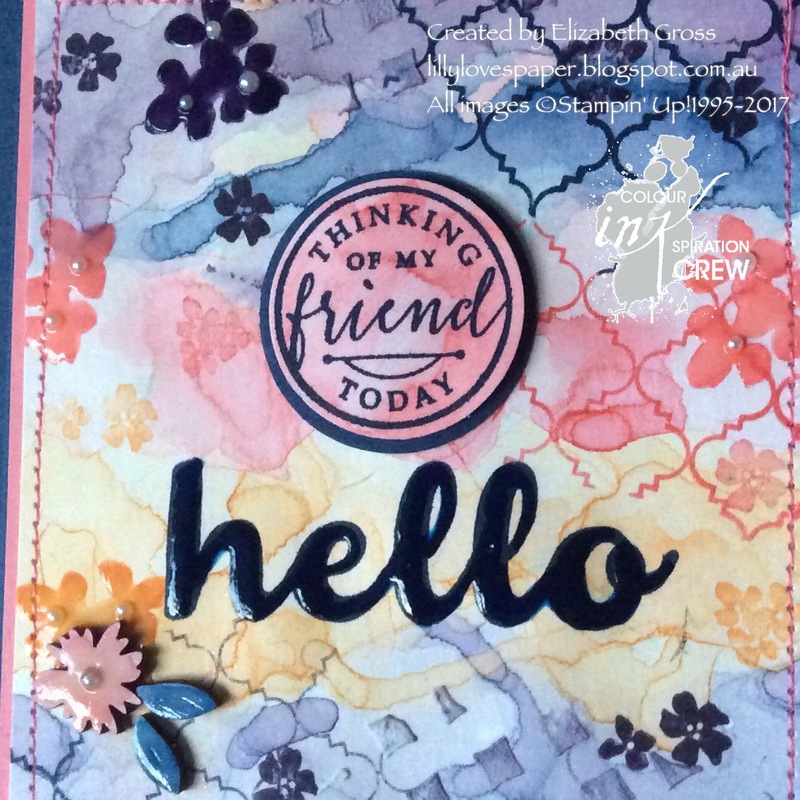 I also coloured the little flower trios and popped a teeny pearl in the centre of each to set within the glue. These too got the fine tip glue treatment. 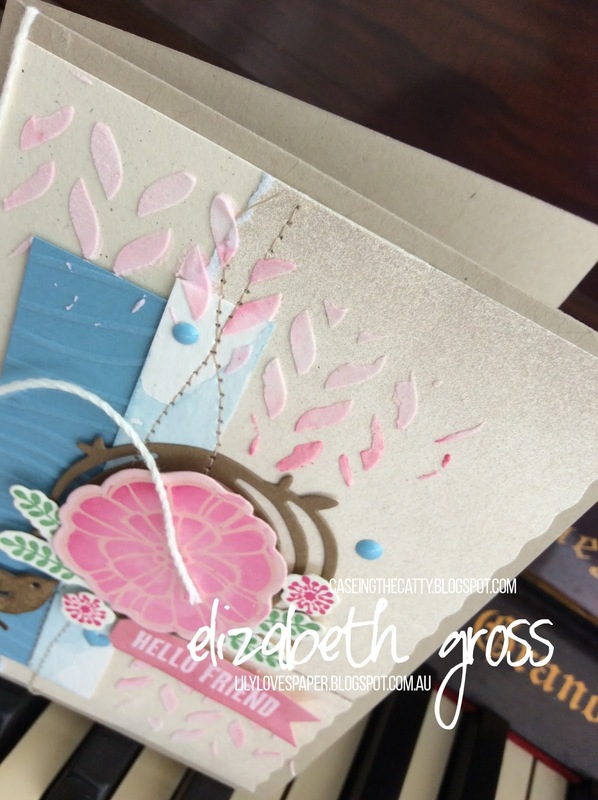 Next this week is Mel and her beautiful project. Enjoy! Thanks so much for looking this week, I hope you enjoy all the entries on the hop! And I hope you feel inspired to create your own project and link it to our Facebook group. I discovered this technique quite by accident and I have used it exclusively since for colouring the embossing paste I use. There is no waste and no mess, and I don't have lots of little pots of coloured paste which might dry out and be useless. it's a simple technique - those are often the best. 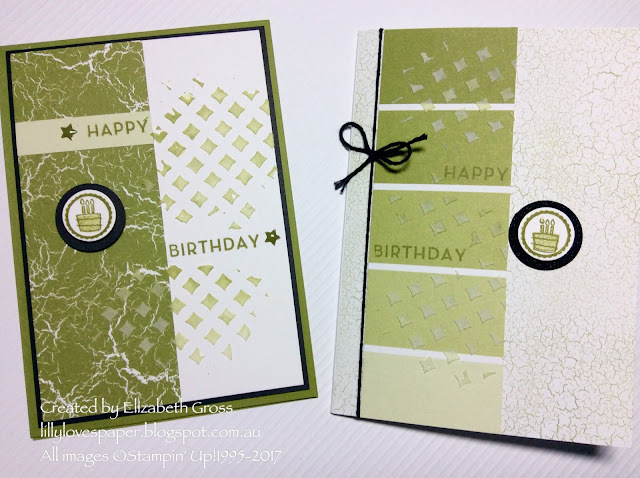 This sample shows the ombre effect you can achieve with varying amounts of ink applied to the mask- it is a kind of random effect and different every time- a bit like the magic of watercolouring. 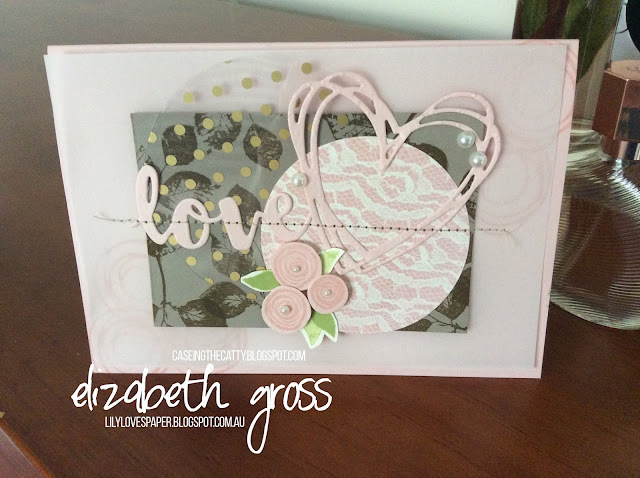 And on this sample I sponged directly onto the card. moved the mask slightly and applied the paste directly. 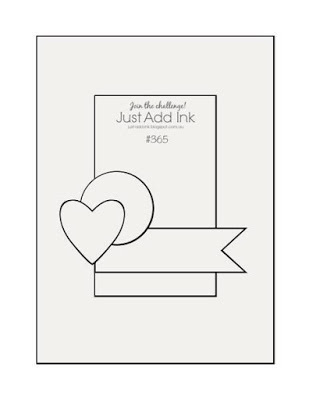 I'm also entering this card in the Just Add Ink Challenge #365 for this sketch. And the last sample used a lighter colour ink on the mask (Pool Party) than the background ink wash colour (Bermuda Bay) to create a very subtle effect. I hope you found this useful and that you'll give it a try. 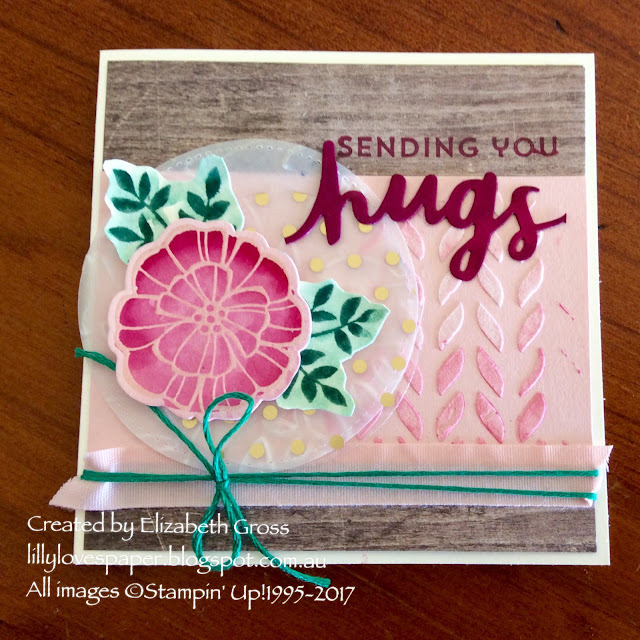 The Embossing Paste is just so much fun to use. Of course for a rich deep colour I would still mix with 1 or 2 drops of ink. 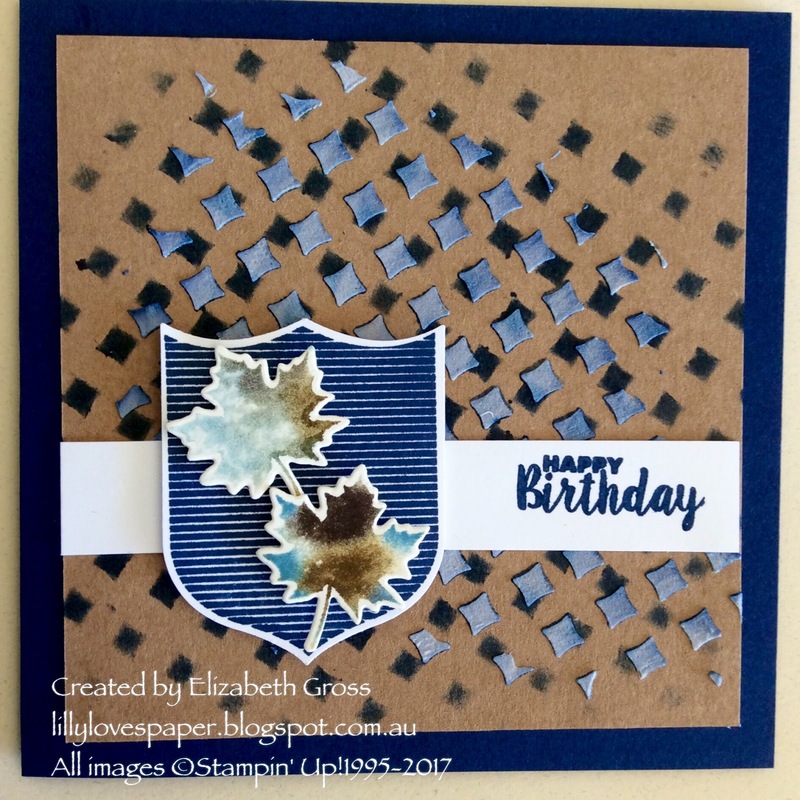 A super quick post to get my card entry in on time. Opened up a set I have been longing to use. Thanks JAI for the inspiration picture. 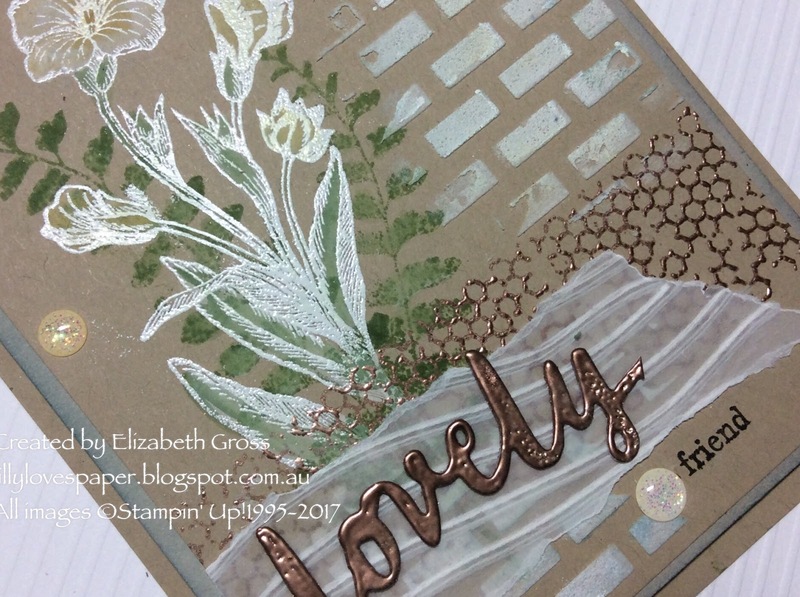 I've picked up the copper from the vase in the copper embossing, the brick motif on the embossing paste, the timber in the embossed vellum and the white and yellow flowers in the painted flowers. I treated myself and finally purchased Butterfly Basics. It's a beautiful set and worth the wait. Welcome back for another week at CTC where we are casing the projects from pages 86-101. 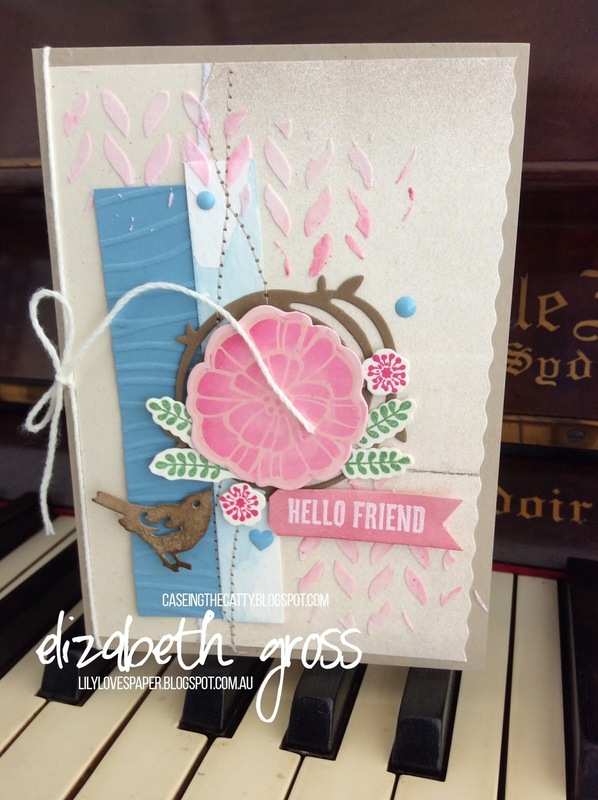 There were a few projects in here which inspired me but I want to take you on a little creative journey to where I ended up this week and a happy accidental new technique I discovered along the way. 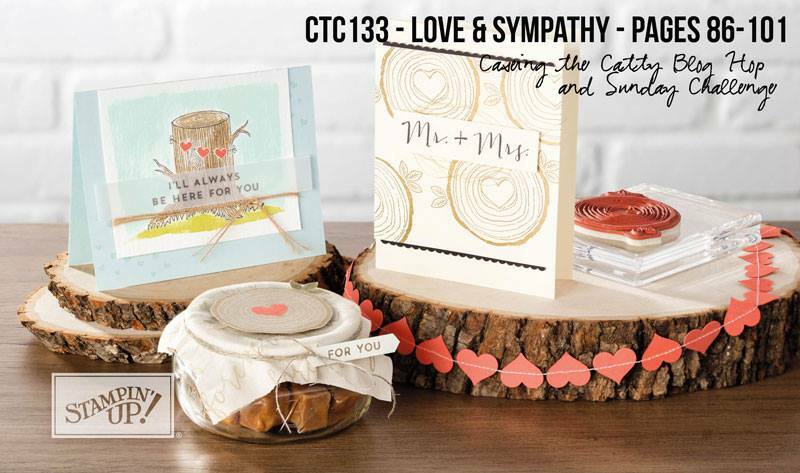 The aim of CTC is to take a project which inspires you from the catalogue and use it as a springboard for your creations. 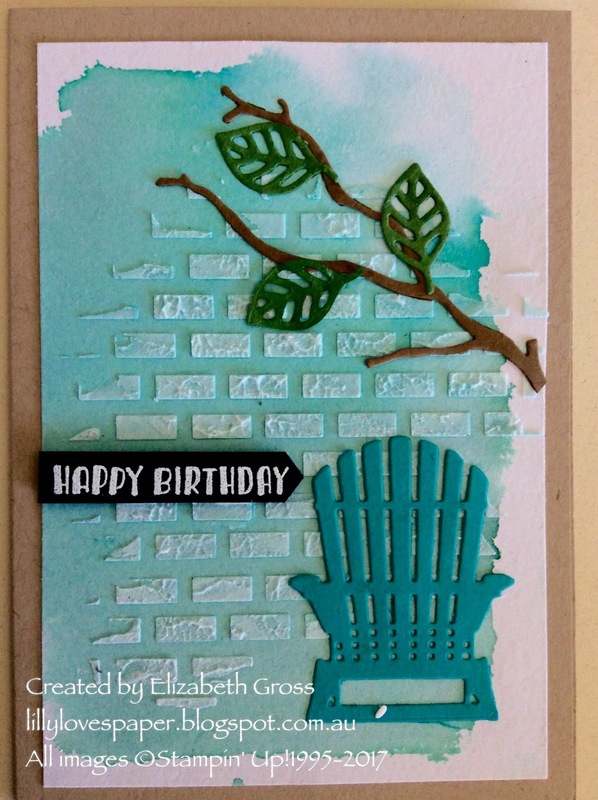 This week I used the card on the top left of this half of page 97. I am a fan of layers and little clusters of elements and of stitching so all 3 of these things appealed in the love you more card here. 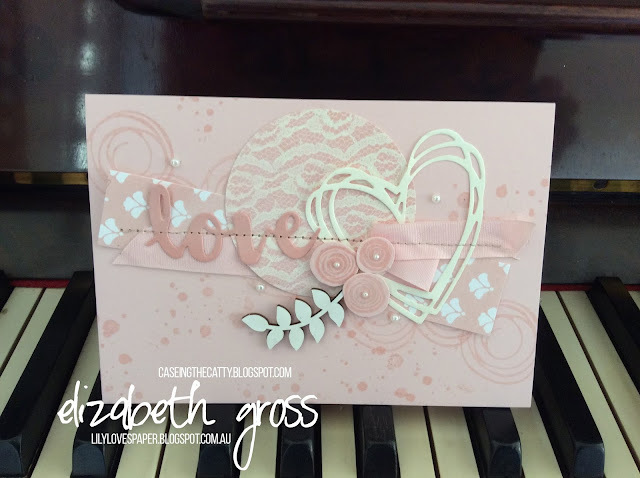 My first card used the same background stamping tone on tone in the beautiful new Powder Pink, the word and heart from Sunshine Wishes Thinlits , the little roses from Swirly Bird and one of the gorgeous new Touches of Nature Elements - these wooden elements are natural timber on one side and white on the other - scrumptious! I poked a little bit of ribbon and paper in there and stitched it all together. And since I still had bits leftover I decided to arrange a third card. Again there are layers of elements stitched onto the base panel. These are the colours used in all these projects. And I'm quite excited to have discovered a new technique by accident. I'm calling it "SPONGED MASK EMBOSSING PASTE TECHNIQUE". I LOVE the new embossing paste and decided to add some to the base instead of stamping. I had been using the stencil mask to sponge a background but didn't realise I hadn't cleaned off the BERRY BURST ink from the sponging. I used the palette knife to spread some of the white paste and noticed it was changing colour as I did so- the white paste was picking up the pink ink left on the mask. BRILLIANT!!!! You can see how it changes colour. So I have now been experimenting and will have a few more cards to show soon. You get the best effect from a strong colour. 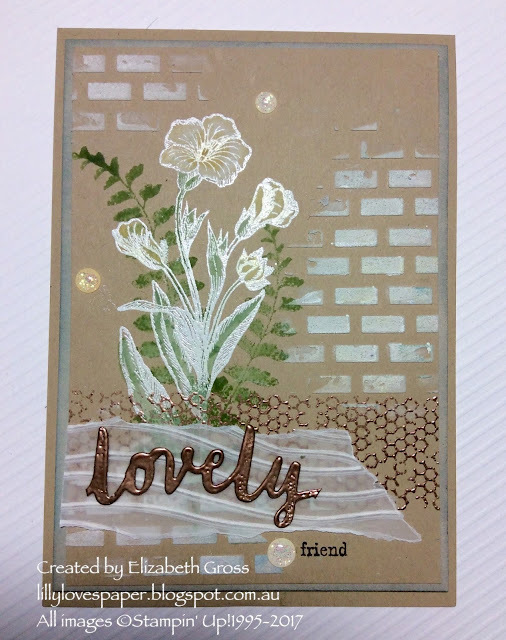 The elements in this card also include bits from my useful box, the flower is clear embossed from Falling Flowers and watercolored, and the green fronds are from Jar of Love. The little bird is from Birds and Blooms , the wreath is from Swirly Bird and Hello Friend is left over from my Wood Words sets. 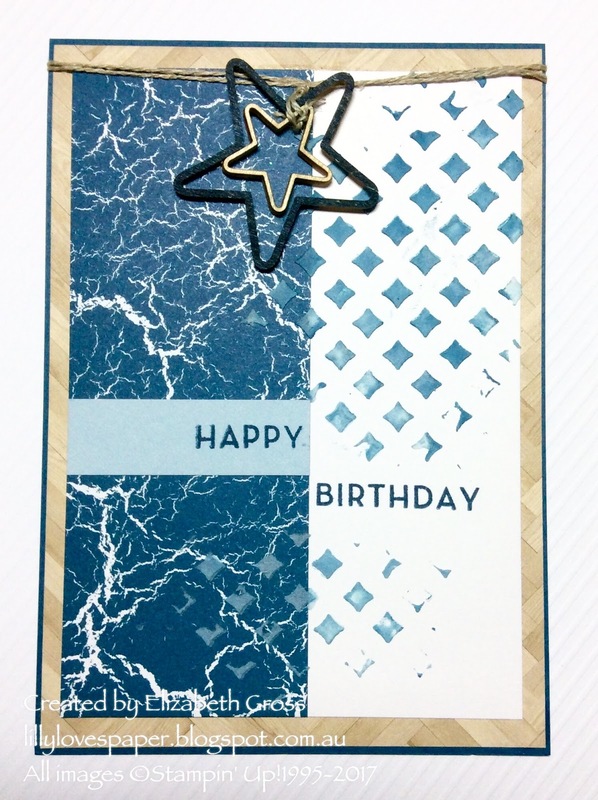 The little enamel elements just tie in the Marina Mist Quite a mix!! Thanks so much for looking, I hope you'll try the "sponged mask embossing paste technique". It's super fun. 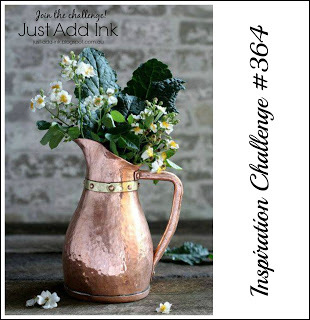 See what projects inspire you in pages 86-101. Make a card or other item and post a photo of it to our Facebook page. We are looking for new designers to join the team and you have to play along in June to be considered. Make sure you mention that you are keen to apply if that's your intention. If that's not your thing then just play along and share your creativity with us- we love to see what you come up with too. Be sure and hop all the way around and check out everyone's creations.